HIGH SEISMIC PERFORMANCE + FRAMING AND FOUNDATION SAVINGS. Buckling Restrained Braces (BRB) are a relatively new type of steel brace. In contrast to typical steel braces which can buckle suddenly due to compressive loads (See Figures 2 & 3), a BRB yields uniformly in compression and tension with no buckling failure. A BRB is composed of four elements: an inner steel core which is the yielding element, a bond-preventing layer around the inner core, an outer steel casing (round or square), and grout infill which provides stability to the inner core (See Figure 1). Figure 2: Traditional Special Concentric Braced Frame - Tested to Failure: Buckling and Rupture. Photos courtesy of Professor Po-Chien Hsiao. Figure 3: Traditional Braced Frame - Tested to Failure: Buckling and Rupture. Photos courtesy of Professor Benjamin Fell. Stable seismic behavior (i.e. - no buckling) allows the braces to absorb a significant amount of energy during cyclic loading. The cost of individual BRB's is fairly inexpensive, opening the door for utilization of BRB's for a variety of project types. Reduced overall building cost. Due to the improved seismic behavior of BRB's, code level seismic forces are significantly reduced for the entire structure. This reduction in force levels results in cost savings for framing elements, connections, and the foundation. 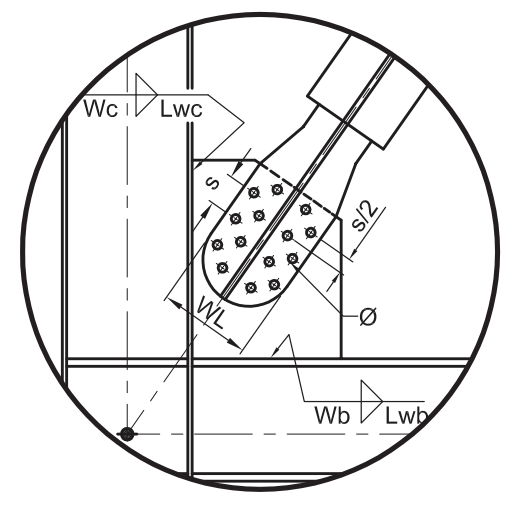 A variety of end connections are available, either to simplify construction installation or achieve a specific architectural appearance if the braces are exposed. See End Connection Options below. A manufacturer of BRB's should be selected early on in the design process. The outer steel core size will likely be larger than a traditional steel brace, which may impact the architectural layout. The bolted connection has plenty of field tolerance resulting in fast and efficient structural frame erection. 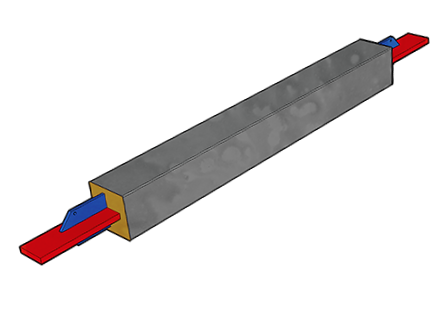 The welded connection provides an efficient solution for projects with relatively low capacity BRBs. Welded braces arrive at the job site completely fabricated and ready for installation with integral erection bolt holes. The pinned connection is ideal when connections are exposed to view. Although this connection has tighter erection tolerances than other connection types, it can make a great aesthetic addition to any project.